This gentleman was sitting in the stands after the game was over and the crowds long gone. It seems as if his team suffered a devastating loss and is just sitting there in a daze, reminiscing about the game. It was taken at sunset with the warm light enveloping the stands. sometimes it just pays to be luck and in the right place at the right time. I was taking images of a JV football game and looked up in the stands and saw the guy with the light from the setting sun. Message edited by author 2006-11-09 07:03:52. Congratulations on your top ten finish with this fine journalistic capture. I gave a nine on this one. I think it is better than the 3rd place one. GOod WORK!! maybe u should crop the upper side to allign, not the bottom... having a second look, i think that it would have been more dynamic if none of them would be horizontal. Also, the car in the backround is disturbing, some burning would be helpful. Well seen! Not all the people have gone home yet. But of course the person adds interest to an somewhat sterile sporting venue. Nice low golden sunlight and shadows. DNMC - i see a person. Great tones, range and comp. Nice take on the theme too. Interesting shot, I love the color and the lighting. I think the angle the shot was taken at tends to make the back wall feel like it's falling over backwards. Would have been a 7 if all the people had gone home, but as it is, 6. I like this shot a lot...I wonder if you're being slammed with DNMC votes. I love the lighting and the great emotive quality of the shot. Good luck in the challenge. I like the mood here. The light makes it feel "post game." The composition is compelling. This image has really grown the more I've looked at (back for a second look to leave a comment). For me, one of the things I was looking for in this challenge was making an interesting image without people, which I think is harder to do. So I rated you a little lower for including the man. I'm sure there's already a thread about whether having a person in the photo is a DNMC and obviously you feel it meets the challenge (and I certainly don't think it's a DNMC - but more of a not exemplifying the challenge). 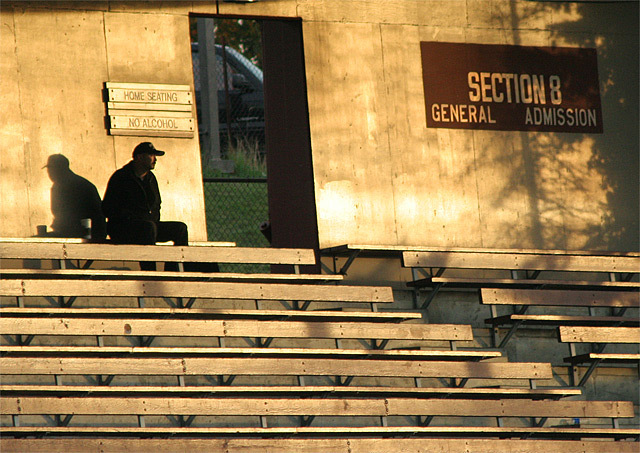 I don't know if you intentionally chose "Section 8" but I can't help but think about a connection to Section 8 housing - a lone person sitting after a game - perhaps with no where (desirable) to go home to. I'm probably totally out in left field here but that makes this image much more powerful to me. And thus the person in the photo has a pretty strong presence for me - so although I think the image (story) is stronger with the person, for this challenge it's a detriment to how I'll score it. Hope you're not rolling your eyes but I wanted to explain all that and say I've really enjoyed your image, thank you for sharing it. Well, this is stretching the challenge a bit (all the people gone) but nonetheless I like the composition and the tone of the photo. It's funny. I didn't notice the coffee cup until I saw his shadow on the wall. :D I like the warm glow of the late day sunlight. I really like this image. The gold colour really appeals to me. Yet, at the same time, it doesn't *technically* meet the challenge. Nicely composed. I wish the gentleman was a little better lit, but that's just a nit. I like this - creative lighting and good colours. Proudly hosted by Sargasso Networks. Current Server Time: 04/26/2019 01:46:43 AM EDT.